It’s no secret that i’m a huge fan of SoLita in Manchesters’ still growing Northern Quarter. As I love trying new places I often don’t get back to a restaurant very often, even if i’ve had a great time there but SoLita is the one place that I just can’t resist returning to again and again despite having already eaten my way through most of the menu. Partly because I love their food but mainly it’s because they never sit still and are constantly tweaking their menu and introducing new dishes and fun specials. Recently several new dishes were introduced and I couldn’t wait to taste them. SoLita already boasts an impressive range of starters including the fantastic but naughty Rooster Scratchings, Sough dour toast with bacon jam and the infamous Pulled Pork Sundae. 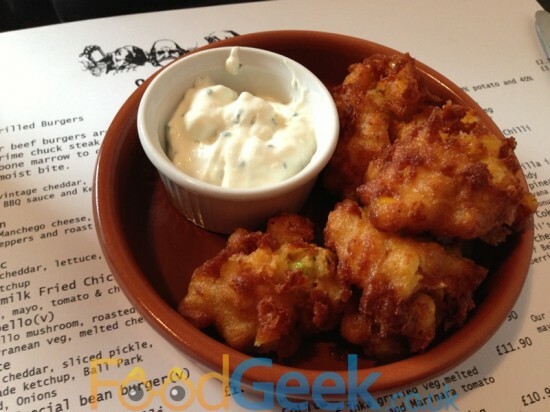 They’ve now been joined by 4 new starters, first up ‘Sweetcorn Hushpuppies’. 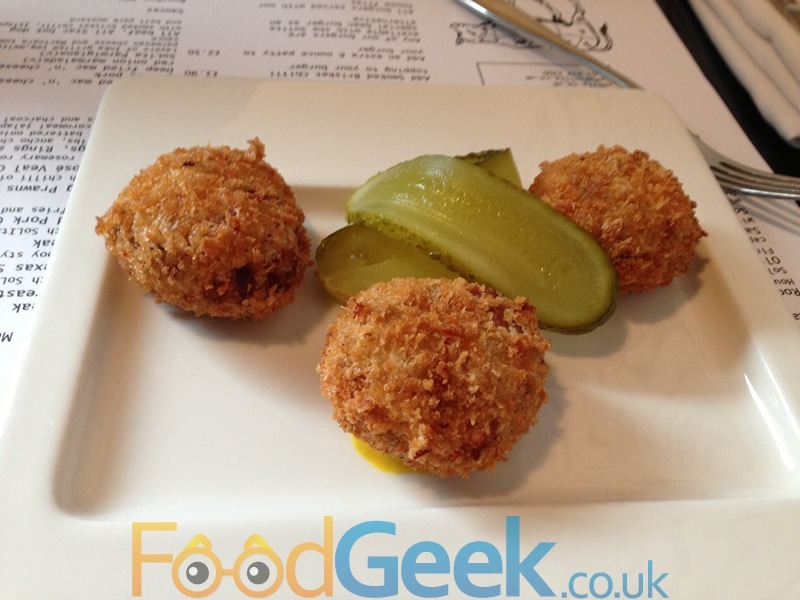 Hushpuppies are almost like savoury doughnuts, famous in the American deep south. They’re usually made with cornmeal and SoLita’s version includes sweetcorn too. They were delicious, really crispy exterior but incredibly light and soft on the inside and packed with flavour. It was supposed to be served with a red pepper jam but for some reason ours came with a sour cream which was a shame but still very enjoyable. If 2012 was all about pulled pork, the early signs are that 2013 might be all about salt beef. It’s popping up on menus all over the place including SoLita in the form of ‘Salt Beef Fritters’. Just like the hushpuppies they were extremely crispy on the outside but inside was full of the most succulent slow cooked beef, brisket I think. Served simply with sliced dill pickle and stuck to the plate with blobs of mustard they’re a perfect example of a simple dish, perfectly executed that tastes great. Not too long ago I would have happily polished off all 4 new starters at SoLita and still had room for a main course. However, recently i’ve tried to be a bit more sensible with the amounts of food i’m eating. Luckily, with some clever ordering it was possible to sample the new starters in main course form. The two remaining starters are ”Ancho Chilli Chicken Wings with fried cornmeal jalapeños’ & ‘Ribs, Wings, Rings & Things’. Thankfully the latter is also available as a main course, even more helpfully it includes the chicken wings and jalapeños from the former. So of course it was an obvious choice for main course. 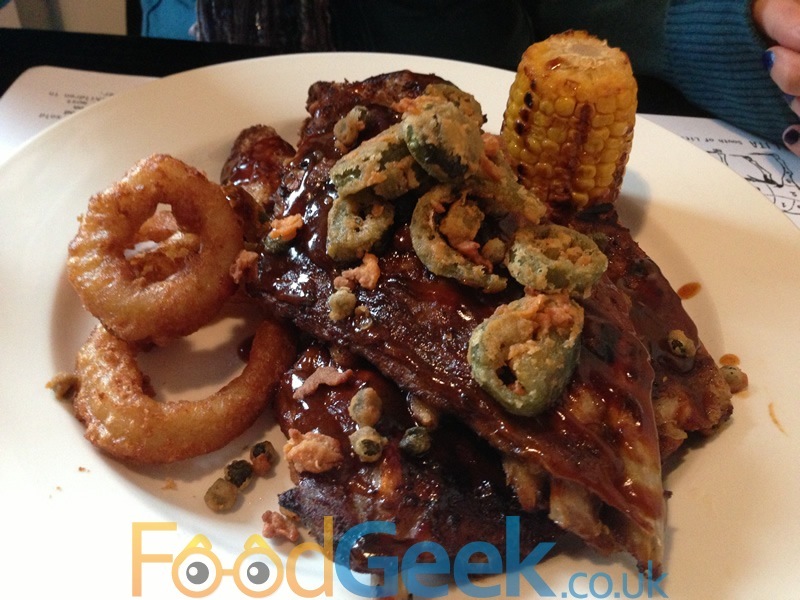 Upon ordering this dish we were asked whether we’d like the ribs cooked in a regular BBQ sauce or a crazy hot sauce made with the hottest chilli in the world the ghost chilli (also known as Naga chilli). Both myself and Mrs FG are big fans of spicy food and also love a challenge so despite being warned that it was seriously hot and offered a free side of milk to help ease the heat there was no question we’d be ordering anything other than the hot version. The dish looked very impressive, the rings of the title were tequila onion rings, I thought the batter was great but I see that they have been changed to beer batter on the menu since my visit. The ancho chilli chicken wings were very tasty and the ‘things’ were a grilled sweetcorn, caperberries and fried cornmeal jalapeños which were all very good, particularly the jalapeños. The star of the dish is definitely the two slabs of baby back ribs, they were tender and falling off the bone. The only problem with the dish is that they really weren’t that hot. I appreciate that we like food hotter than average but when a sauce contains ghost chillies and comes with a warning and free side of milk it really needs to have some decent heat behind it which unfortunately this didn’t. It wasn’t totally lacking and I can imagine some people may even find this too much but it definitely wasn’t as as promised, it did still taste very good though. It wouldn’t be a trip to SoLita without trying a new burger and this time the ‘Big Manc’ was so special I felt it needed a blog post of it’s very own! You can read all about it here. So, SoLita have done it again, despite not being even nearly a year old yet they’ve improved and added to an already brilliant menu with some exciting and tasty new dishes. Since my visit there have been even more additions to the menu and several new specials which i’m already plotting to return for. Next: What’s Bigger Than A Big Mac? A Big Manc!